Spencer: Who is Midnighter? It’s clearly a question writer Steve Orlando wants to keep on his readers’ minds, as most issues of Midnighter feature its titular character explaining his life story to someone (this month, his documentarist Robert). Any conclusions we can draw about who Midnighter really is deep inside from that information, though, are complicated to say the least. Who is Midnighter? He’s a contradiction. The contradiction that is Midnighter can be seen most clearly by comparing the first half of this issue and the second. Midnighter 9 opens with Spyral firing our hero into Amanda Waller’s Crow’s Nest satellite from a giant rail-gun (“That is awesome,” quips Midnighter). Once aboard, Midnighter proceeds to beat down every obstacle in his way with uninhibited glee; he claims that his “arm is complete again” when he picks up a crowbar as a weapon, and brutally and efficiently murders a speedster guard without ever losing his smile. Neither Orlando nor Midnighter himself even attempt to hide how much perverse pleasure he’s getting out of the violence; if Midnighter’s the “gay Batman,” as so many sum him up as, then he’s clearly the unhinged, violence-crazed Dark Knight of All-Star Batman and Robin the Boy Wonder. Unlike that particular take on Batman, though, Midnighter’s enthusiastically violent tactics have been called into question more than once. Prometheus essentially called Midnighter a hypocrite back in issue 7, while this time around Robert breaches the subject in a far more tactful manner. I’ve always called Midnighter a character with a surprisingly compassionate side; for all his violent tactics, he only attacks people who “deserve it,” never victims like Marina or last issue’s chimeras. 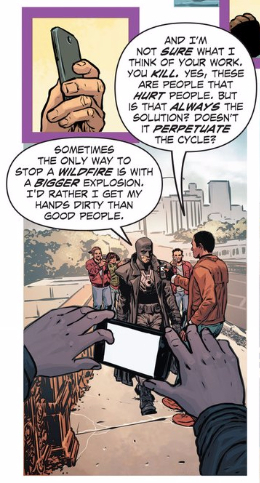 Orlando adds an interesting wrinkle to Midnighter’s compassion this month by pointing out that he takes many of his violent, murderous actions so that others won’t have to dirty their hands with them. It’s self-sacrificing and self-depreciating in equal measures; apparently Midnighter thinks so little of himself that he doesn’t feel like he deserves to keep his hands clean, yet also thinks so highly of himself when it comes to battle that he’s legitimately shocked when Afterthought counters his every move. Like I said: Midnighter’s a contradiction. In contrast to Midnighter’s effortlessly successful, gleefully violent mission in the first half of the issue, his scuffle with the Suicide Squad in the second half seems to be calling the efficiency of his violent tactics into question. Midnighter and Robert are injured in an explosion Harley Quinn set up while Midnighter was busy fighting Afterthought. Admittedly, Midnighter had no way of knowing about Afterthought’s ability to see five seconds into the future, and thus that he wouldn’t win in a single strike like usual, but still, his eagerness to attack Afterthought distracted him from what the rest of the Squad was up to, putting Robert (and himself) in danger. Of course, machismo and the tendency to solve problems with fists are qualities inherent to most superheroes (and to the genre in general), but over the course of this series, Orlando’s used them to define Midnighter (especially since he enjoys it so much). 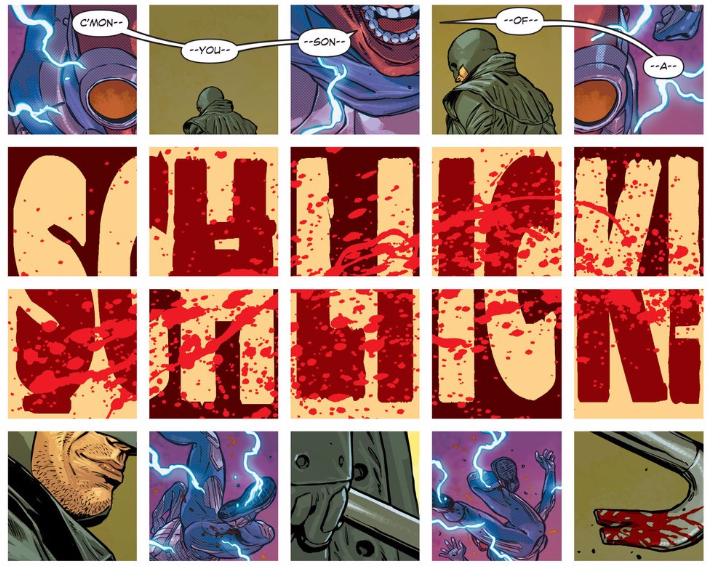 It’s notable that the first half of Midnighter 9 continues that trend, portraying his violence as humorous and effective; once Robert asks his question, though, suddenly everything changes, and violence no longer seems as positive as it once did. This arc’s only just beginning, but Orlando’s raised some excellent questions thus far. Are Midnighter’s most endearing qualities (and most effective tactics) also his greatest weaknesses? Do the results justify the violence he inflicts to achieve them? Is there any way to balance out Midnighter’s conflicting methods and views of himself — does he, should he, have to be a contradiction forever? I can’t wait to see these questions explored as the story continues. ACO returns on art this month (assisted by Hugo Petrus on four pages), and there’s a bit of an interesting disparity to their work too. At first ACO’s art can seem confusing, but it’s actually incredibly clear and detailed, just so much so that it can be disorienting at first glance. As we’ve discussed before, the overwhelming amount of information ACO includes on each page does wonders to put readers in Midnighter’s shoes. Nowhere is this more clear than in the splash page where Midnighter prepares to attack the speedster, but I’m actually more fond of the next page, which depicts his attack in extreme detail. First of all, Romulo Fajardo Jr.’s colors are incredible here. Wow! What I find most interesting, though, is that this entire sequence takes place over the course of a single, super-speed-filled second — Midnighter’s perceptions are so fast that even this single instant can be split down into twenty separate panels from his perspective. Those small insert panels ACO uses to isolate details — combined with letterer Tom Napolitano’s word balloon placement — make for some remarkably intuitive layouts as well. Look at the way they lead the reader’s eye across the page: the first insert panel, then the word balloon leads to the second insert panel, then to the next word balloon, so on and so forth. It’s stylish and clear, always a winning combination. Actually, these layouts also help to emphasize Midnighter’s perspective — like Midnighter himself, first we see the full picture (the background panel), then are encouraged to focus on all the small details that flesh out the rest of the story. 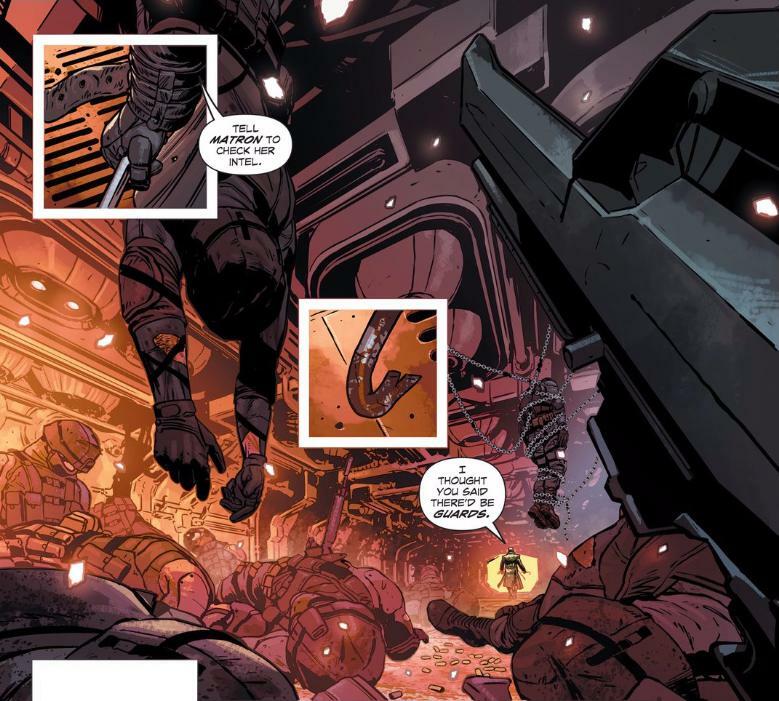 ACO is such a perfect fit for Midnighter, and even the success of Petrus’ pages can be chalked up to how fully he embraces the storytelling techniques ACO’s established for the series. Mark! Do you find Midnighter’s complicated, conflicted nature as compelling as I do? What do you think of the Suicide Squad’s use here? Do they do too little, or are Afterthought and his speedster cohort (may he rest in peace) more interesting choices to focus on? How long to you think it took Harley to drive all those nails into her baseball bat? Mark: Well, the Suicide Squad don’t get much to do in the last few pages of the issue, so it’s funny to me that the cover promises that “Midnighter Takes on the Suicide Squad.” But with fairly abysmal sales numbers and persistent rumors of its impending cancellation when DC reboots or whatever with Rebirth, I understand why they’d pimp Suicide Squad out instead of “Midnighter vs Afterthought.” I’m assuming Harley Quinn and Deadshot will play bigger roles next issue (or maybe they won’t, which would be hilarious! ), but in this issue Harley’s well-manicured baseball bat is about the most interesting thing Suicide Squad-related. I read a lot of science fiction and fantasy novels, and one aspect I really enjoy is a well-thought out magic system. My favorite fantasy author, Brandon Sanderson, excels at creating magic systems with very clearly defined rules. Early on his books you understand the basic logistics of how the magic works, and what its limitations are. Knowing the rules and limitations of the magic system increases the tension (and our enjoyment) of the story because when our hero butts up against them we understand the ramifications. It’s why the Prometheus reveal at the end of Midnighter 6 was so brilliant, and it’s why I found Afterthought’s confrontation of Midnighter so compelling. As readers, we’ve had 8 issues to familiarize ourselves with the rules of Midnighter’s powers, and now Orlando is able to exploit those rules and allow Midnighter a moment of combat vulnerability.So much of Midnighter’s attitude—his sass, even— stems from the fact that he’s unbeatable. Defeat is a position Midnighter is rarely (or even ever) in, and it means that the meatiest discussion of his dual nature probably lies in future issues. But I’m still not sold on Midnighter’s willingness to open up to documentarian Robert. Is there an explanation for this in a previous issue that I’m forgetting, or is it something that kind of popped up out of nowhere and we’re all just rolling with it? And how, exactly, is Midnighter’s life story going to help people? That feels insane to me. Nice to see another Brandon Sanderson fan. And yeah, Sanderson’s use of rules in his magic systems are fantastic. Ultimately, all stories come down to interaction, and that’s why systems so often work well in stories. Two complex systems interacting can create just as interesting results as two complex personalities. In fact, that’s the genius of Brandon Sanderson. A scene of Wax fighting Miles, for example, shows complex interactions between two magic systems, complex interactions between two personalities of differing philosophies and complex interactions between planets as we understand that the events of the fight influence what’s happening not just in the Mistborn series, but in the Stormlight Archive and all of Brandon Sanderson’s other books. Brandon Sanderson’s use of highly elablrate systems, whether it is the strict rules of Allomancy or interconnected narratives that connect Mistborn, Stormlight Archive, Elantris and Warbreaker together (Hi Hoid!) means that a single event is layered with multiple complex interactions. It is unsurprising that the end of his latest book, Bands of Mourning, is so intense. From every level you can think of, the events are game changing. Whether it is the effect on the characters, the effect on the setting, the effect on our understanding of magic or the effect on every other book Sanderson has written, something important is happening. I think he is doing a comic this year. Looking forward to it.